I used to iron most of our family’s clothes. I didn’t bother with underwear, sleepwear or linen, but ironed pretty much everything else. My friends used to tell me they never ironed, and I couldn’t believe it – I expected they’d be all wrinkled up, but they weren’t! I would spend around 3 hours a week ironing, and I hated the ironing basket. It was always full and always there, staring at me and reminding me I had to do something I hated doing. However, I was compelled to iron because the clothes were always so creased. I could not conceive not ironing. Then my life changed when we went on a 4-week family road-trip style holiday. We lived out of suitcases the whole time, frequently moving and therefore frequently packing and unpacking (and never hanging anything). I realized that we didn’t look all wrinkly all of the time, and that it wasn’t so bad, this No Ironing Thing. So when we returned home, I repurposed my laundry basket (it’s now our shopping bag basket) and never looked back. I got hints from my best friend, who had some great ideas (thanks Kym!) on how to prevent creases, and I’ll share them with you now. Firstly, I still try not to use the dryer. It doesn’t rain much where I live, so we dry outside on the clothesline most of the time. We do this to save on electricity usage, mainly – cheaper and more environmentally friendly. When I do, I just apply the same rules as below, essentially (except for the drip-drying). 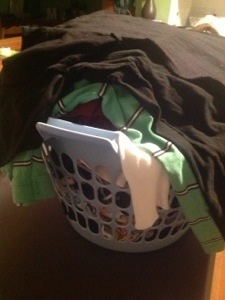 – As I get them off the line, I put them in the basket in this order: undies, socks (paired immediately), sleepwear (folded), shorts & pants (folded), things that don’t crease (folded). Then finally I lay flat out over the top of the basket the clothes that usually crease a little like t-shirts dresses and shirts (hanging stuff). – A few hours later I hang the hanging items – they have ironed themselves on the back of the couch (sometimes I lay them flat on the bed, too). Sometimes I’ll get something out of the wardrobe to wear and it’s a little creased – so then I give it a quick iron, but this is rare. I have also learned that your body heat will also smooth out wrinkles once you’ve had it on for a little while, too. It’s also useful, of course, to buy clothes made from fabrics that don’t crease easily! Finally, ditch your perfectionism – no one will notice, trust me! And you’ll be a changed person! 1. Pure cottons will crease – try to buy items with a small amount of synthetic in them, e.g. poly cottons – they don’t tend to crease. 2. Hang shirts, dresses and skirts on coat hangers while they’re wet and hook them onto the clothes line to dry. No ironing needed! Take them off the line last so they don’t get creased by anything else. 3. Always fold the clothes as you’re taking them off the line. That way if they do stay in the basket for a while longer they won’t crease. 4. School uniforms – fold along the crease of trousers (of permapress items) and peg both leg cuffs together on the line. Run fingers along the crease of trousers and skirt pleats while they’re wet and hang on the line. When they dry they look like they’ve been ironed. 5. Totally agree with hanging socks up in pairs. Then fold when taking off line. So easy really. 6. The only thing that REALLY needs ironing is tea towels and hankies – kills the bacteria.